One of the great joys of spring. 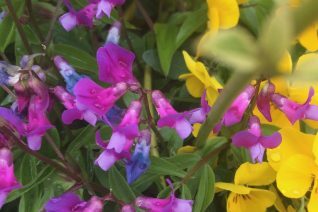 Vernal Pea erupts in a fountain of blue/purple/magenta pea flowers for many weeks in spring. New foliage and flowers emerge simultaneously in early spring but blooming continues for an extended period. As the plant expands it becomes a 2′ x 2′ round mound. Following flowers the deep green foliage remains handsome through summer. Full sun to very light shade in rich, well drained soil with light but consistent summer water. Very, very long lived perennial. Not often available in great quantities as it is raised by seed and our crop is dependent on the viability of each years seed set. Very easy to grow. Not bothered by slugs/snails. Mix with early spring ephemerals, bulbs, Hellebores. Nice small cut flower.